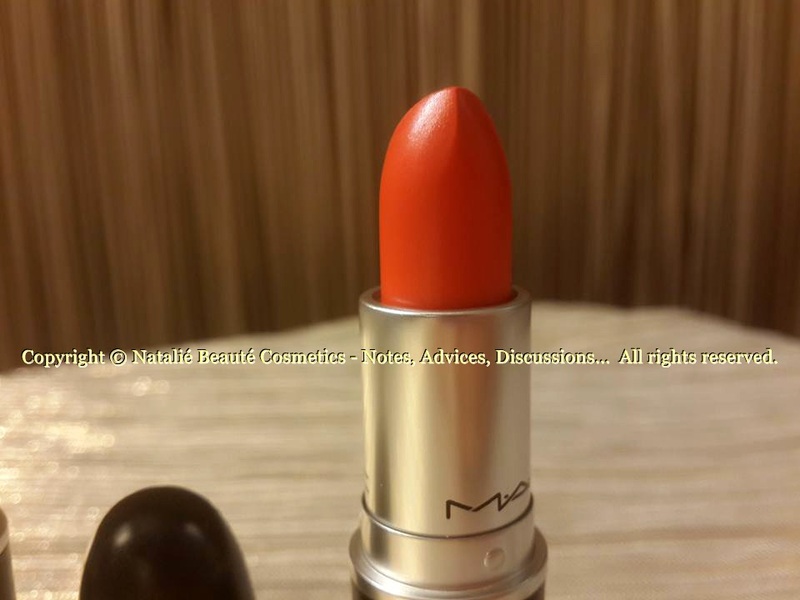 Cosmetics - notes, advices, discussions...: "SOFT HINT" AND "OBI ORANGE", UNUSUAL COLORS, BRIGHTEN YOUR SUMMER, ADD TOUCH OF MYSTERY by M.A.C. 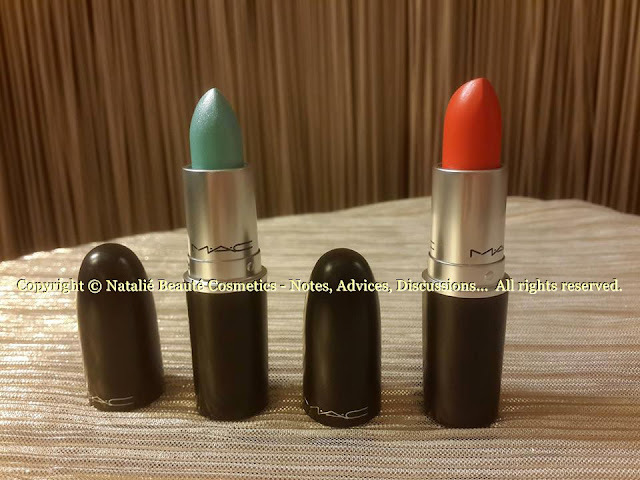 "SOFT HINT" AND "OBI ORANGE", UNUSUAL COLORS, BRIGHTEN YOUR SUMMER, ADD TOUCH OF MYSTERY by M.A.C. This year, MAC surprised us with new colors and shades. That's one constant, interesting and adventurous journey, in the endless world of the beauty market. 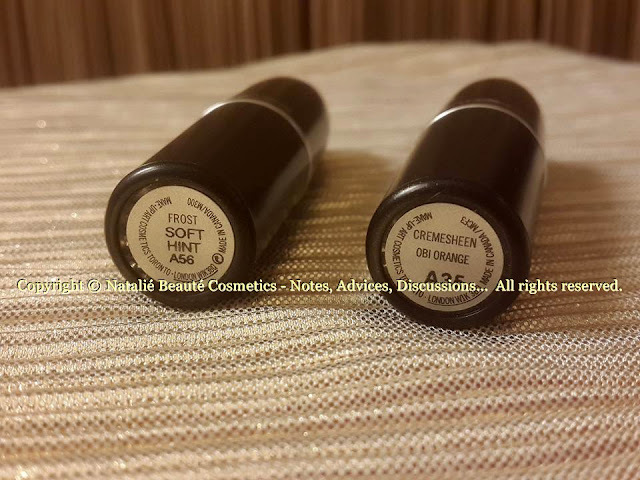 Recently, I've visited MAC and found new colors for me - SOFT HINT A56 from FROST Collection and DARE TO WEAR Line, and OBI ORANGE A35 from CREMESHEEN Collection. Very beautiful and lovely colors. "A lipstick with hundreds of hues. The iconic product that made M·A·C famous. SOFT HINT - Candy blue with blue pearl [Frost]"
The color is beautiful itself. Sheer shade. Swiped on the skin, the lipstick appears very sheer and transparent, going into silver shade. 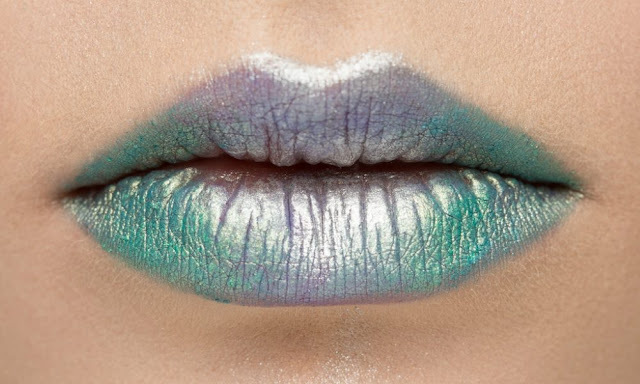 On bare lips, it gives icy cold, blue glow, noticeable, as magical metallic touch. You can use it as final touch on other color. You can use it also as cheek glow. It all depends on your artistic creativity and fantasy. "A creamy lipstick infused with pearlized pigments and a moisturizing serum blend. Cremesheen Lipstick, infused with pearlized pigments and a moisturizing serum blend, is available in 10 new Asia-inspired shades. Prominent pinks, radiant reds and contemporary corals. Flatter all skin tones with a finish, that leaves lips luminous. With foolproof color coverage, this update to Cremesheen is the new Yin and Yang for your lips. 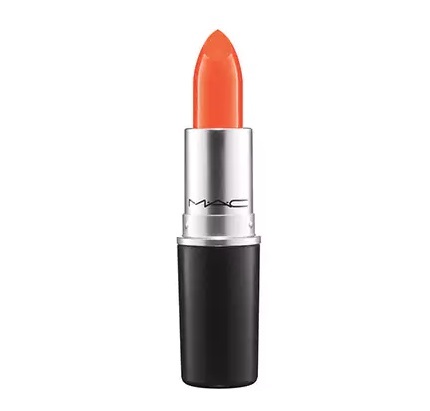 OBI ORANGE - Intense clean reddish orange (Limited Time)"
This color looks as intense Orange, but in the reality, it's very creamy shade - soft, warm, fresh, with reddish undertone. This is one very beautiful shade, which arranger together with suitable makeup and appearance, can make wonders. Color for warm type of women, with positive temperament and character, creative people, innovative, energetic, enjoying everything new, adventurers. Very interesting shades, which you must try. Each one of them has its own characteristic and its own dignity, which deserves your attention and creative impulse, to be realized as final art masterpiece. I didn't add swipes, because any kind of swipes - on skin, on lips, and especially on photo, can give only approximately impression, what the color might look like. All computer and mobile screens have different color appearances and color intensity, so this can not be realistic example, no matter how HD the photo and the technique can be. 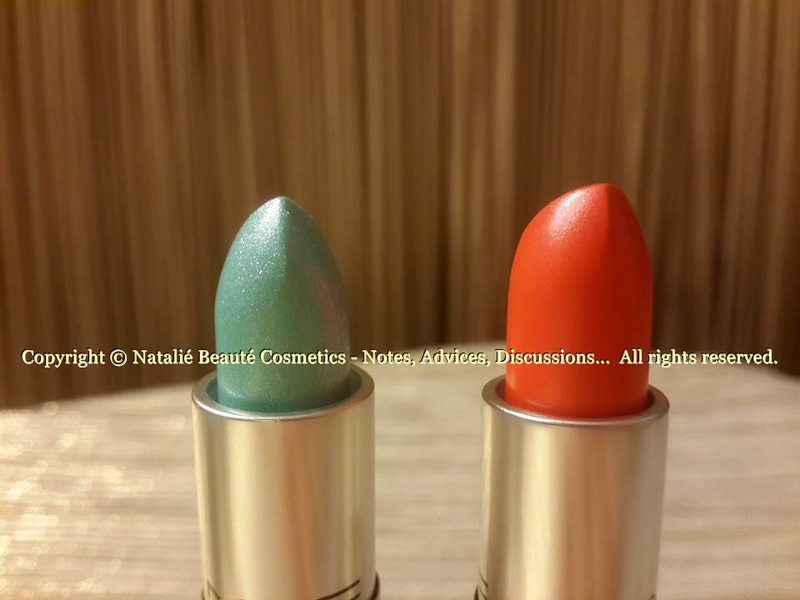 Choosing such product, is very individual thing and you must try the particular make up product on your own skin and lips. Your own skin tone and lips tone will show you, how this product relates with your own characteristics. 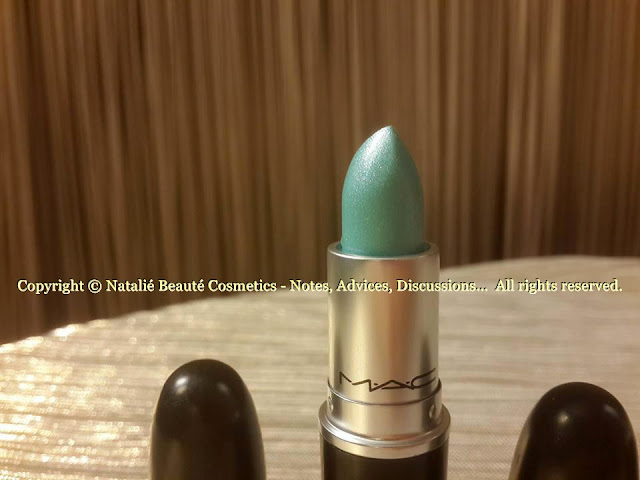 When you see this colors in MAC, try them. Maybe, you will be inspired to create something unique. Who knows?